While the total number of programs remained consistent, the HPI saw an increase in Mortgage Credit Certificates (MCCs) across the country, representing more than 8 percent of all programs. 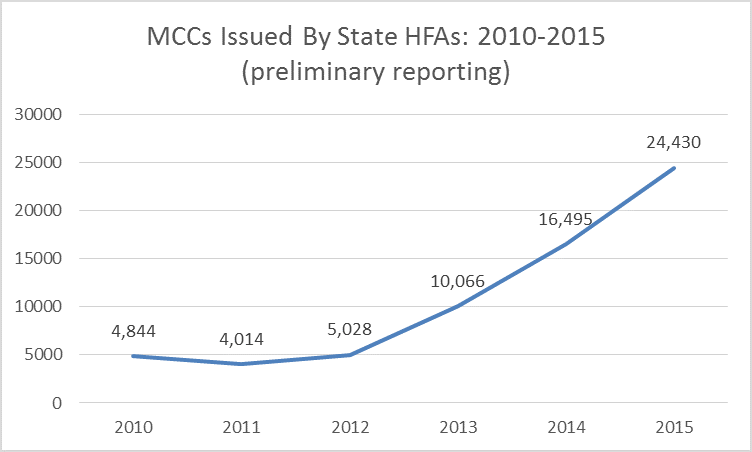 Between 2010 and 2015, state housing finance agencies increased MCC issuances to homebuyers by more than 400 percent, according to preliminary data from National Council of State Housing Agencies (NCSHA). The MCC is a tax credit program that allows eligible homebuyers to claim a percentage of the mortgage interest they paid as a tax credit on their federal income tax return. The percentage of mortgage credit allowed varies depending on the state or local housing agency that issues the certificates, but the credit itself is capped at a maximum of $2,000 per year by the IRS. The buyer may continue to receive an annual tax credit for as long as they live in the home and retain the original mortgage. Qualifying homebuyers are permitted to use an MCC alongside another type of down payment assistance program, such as a grant or forgivable loan. These benefits can help secure the borrower’s ability to repay and lower their tax bill each year. Across the U.S., there are 200 different MCCs available, up from 190 in the previous quarter. 93 of the MCCs are available state-wide and 107 are available in a defined local market. 37 states have either a state-wide MCC or some type of local MCC available. Texas, California and Florida are home to the greatest number of MCCs. 47 percent of MCCs require the buyer to be a first-time homebuyer.